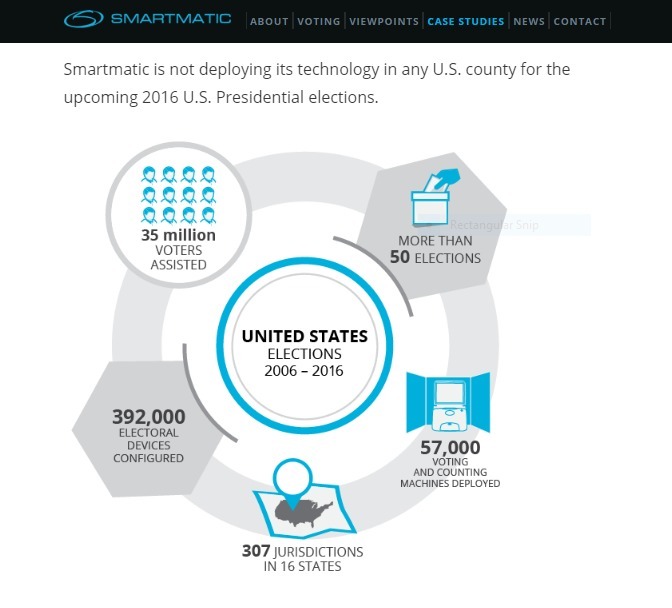 It seems that after taking a lot of heat lately Smartmatic made a statement on their website that they are "not deploying its technology in any U.S. county for the upcoming 2016 U.S. Presidential elections." They probably forgot to update the picture however. It says 2006-2016. The full story is actually quite complicated. In 2005 Smartmatic purchased Sequoia, the company did provide voting machines to the US elections. Then they sold Sequoia to some private US investors in 2007 before the 2008 US presidential election. It is worth to mention that George Soros was also the top donor of Obama in both 2008 and 2012. Finally Dominion Voting Systems purchased Sequoia in 2010. Now Dominion Voting Systems are providing voting machines to the US upcoming presidential election 2016. They had obviously re-edited the website carefully in the past few days. The diagram however does seem to suggest that their voting technology is behind the US elections from 2006-2016, regardless the final brand name appeared on the machines.